Nasturtium‘s botanical name is Latin for trophy, a war like reference to the round leaves that resemble shields and to the flowers that bring Greek warrior helmets to mind. The colorful and delicate plant is from Peru, Where it was once used to treat skin wounds. It was brought to Europe during the seventeenth century and first cultivated only in abbey gardens for medicinal usage. 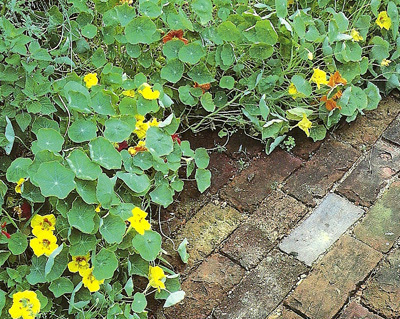 Today, nasturtium is used in cooking and as an herbal remedy. 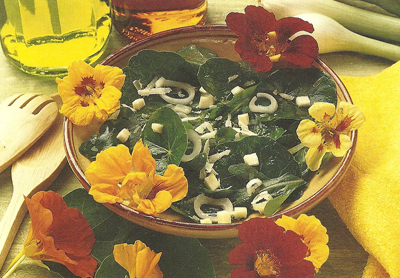 The plant’s peppery leaves can make a delicious addition to a salad (as long as pesticides weren’t used on the plant). The vibrant flowers are edible as Well as decorative, and the seeds can substitute for capers. Nasturtium is most often used to stimulate the appetite and promote good digestion - a perfect blend of this delightful plants culinary and medicinal properties. The pungent flavor of the leaves adds a piquant note to green salads. You can also shred the leaves and use them in egg dishes or mix them with soft cheeses. 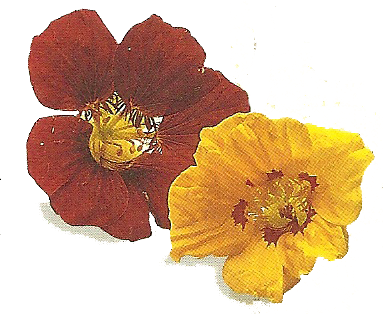 Freshly pressed nasturtium juice can help prevent and treat colds, infections and flu. The sulfurous compounds have an antiviral property, and the high vitamin-C content helps to boost the immune system. Nasturtium juice is available at health-food stores. lt is also easy to make at home with a juicer and some fresh stems, leaves and flowers. Drink 1-2 tbsp. of the fresh juice each day. The leaves, stems and flowers of nasturtium are edible and make a beautiful addition to any garden.The decorative nasturtium leaves have a slightly peppery taste, similar to watercress. The plants,however, are not related. Use the delicate flowers to flavor sorbets, custards, jams, jellies, teas, liqueurs, fruit punches and wines. Chop the flowers and add them to risotto. Or toss them with olive oil as a topping for pasta dishes. The attractive flowers add bold dashes of color as a decoration or garnish for cakes and pastries. Copyright © 2014 Farmers Daughter Herbs. All Rights Reserved.